How Long did it Take to Paint That? The truth is, I never know how to answer this question when people ask. I work on multiple paintings at once, often bouncing from one to another in the same session. Each painting is infused with lots of energy, intention, play, fun and joy. I put down texture and color, layers and richness as I go. 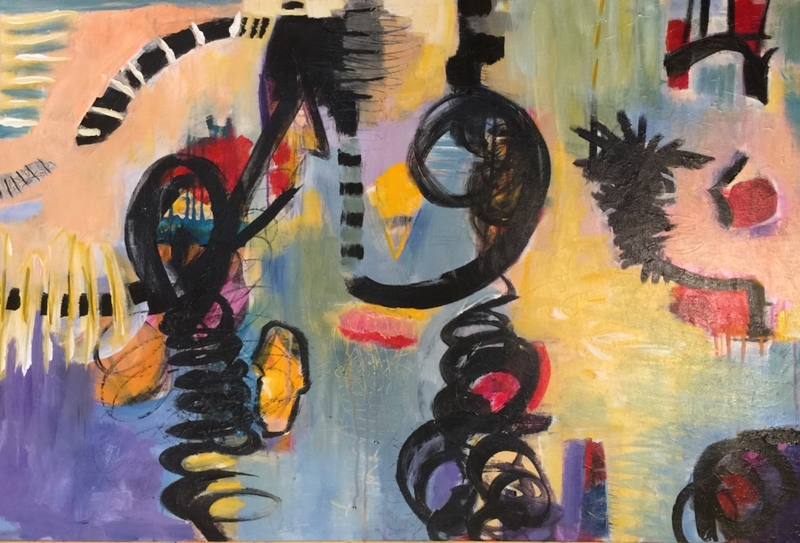 When I dig deeper to answer this question, I can’t help but think my latest paintings are loose and fun because I’ve been studying color, composition, art, and my inner world for a good 40+ years. Every doodle, every art journal entry, every museum visit has lead me towards the creation of the latest painting. Each art piece is a practice of letting go, taking risks and having faith in the process. Finishing a piece involves facing the inner critic and telling her to leave me alone. It requires determination and faith that I CAN get to the other side and resolve the piece. Painting is a spiritual practice where I come up against myself on a daily basis, alone in my studio. Sometimes the only thing to do with a painting is to step away. Go for walk in the park. Or sit by the river. So, I ask myself, “Does that ‘count’ as part of creating the painting?” Or are people asking about the actual hours of putting paint on a canvas? Sometimes a painting will sit in my studio for months, almost finished, but “not quite there” and after 5 months of seeing it and not wanting to mess it up, I will whip out the final layer in one session because it’s brewed within me and that “something” is ready to emerge. How long did it take me? I have no idea. Months of waiting? Months of looking? Years of building up my skill level? Years of practice letting go, trusting my own marks, learning to love my marks? Years of playing with color and finding my voice in line and form? The truth is, it has taken my whole life to paint the latest painting. It pours forth from a deep place within. Paintings are works of art because they embody the energy and intentions of the artist who created them. They are literally a piece of the artist. When you buy a piece of art, you are taking home some of the energy of that artist. That’s why original art is so powerful. So, how long does it take to make a painting? You tell me.